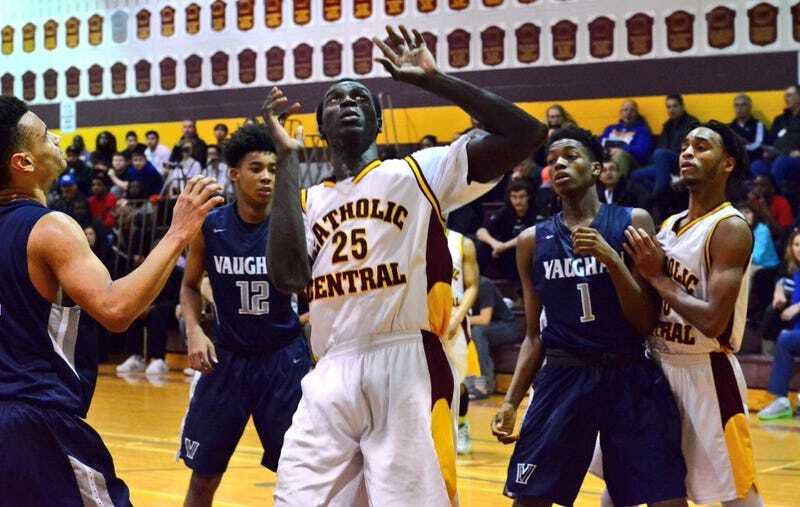 Last week it was revealed that Jonathan Nicola, a 6-foot-9 junior tearing it up for Catholic Central High School in Windsor, Ontario, was not indeed a 17-year-old kid dunking on a bunch of fellow teens, but instead a 29-year-old man dunking on a bunch of unsuspecting teens. Nicola told authorities it was an honest mistake. “I aways keep asking what is the specific age that I was born, and she has told me that she could not remember,” he told the April 19 hearing. “Over (in South Sudan) . . . not every year we study . . . we always keep moving to different schools, and over there, they do not ask your age. They do not ask you nothing,” Nicola said. Nicola said he had been approached by a “coach Steyn” who promised to get him a student visa to play basketball in Canada, and that Steyn handled all the allegedly fraudulent paperwork. “I told him, no, I was not born in 1998. I told him that I am too young for 1998. I’m not in 1998. Then he told me, ‘No, you go back ask my mother, ask my mother how old am I.’ And my mother she do not even remember. She told me 1993, 1990,” Nicola said at the earlier hearing. It wasn’t until Nicola applied for a travel visa to the United States, a month after he arrived in Canada, that border authorities started to connect the dots. The fingerprints for that application matched those of a man who had unsuccessfully applied to enter the U.S. as a student on a full scholarship in April 2015. In that rejected application, Nicola’s birthdate was listed as 1986, instead of the 1998 listed on his Canadian visa application.